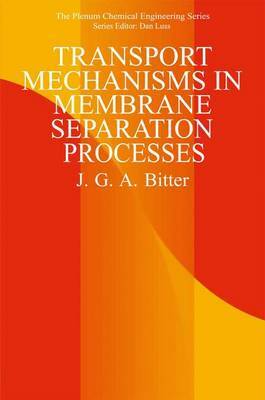 The present book contains a comparison of existing theoretical models developed in order to describe membrane separation processes. In general, the permeation equations resulting from these models give inaccurate predictions of the mutual effects of the permeants involved, due to the simplifications adopted in their derivation. It is concluded that an optimum description of transport phenomena in tight (diffusion-type) membranes is achieved with the "solution-diffusion" model. According to this model each component of a fluid mixture to be separated dissolves in the membrane and passes through by diffusion in response to its gradient in the chemical potential. A modified Flory-Huggins equation has been derived to calculate the solubility of the permeants in the membrane material. Contrary to the original Flory-Huggins equation, the modified equation accounts for the large effect on solubility of crystallinity and elastic strain of the polymer chains by swelling. The equilibrium sorption of liquids computed with this equation was found to be in good agreement with experimental results. Also, the sorption of gases in both rubbery and glassy polymers could be described quan- titatively with the modified Flory-Huggins equation without any need of the arbitrary Langmuir term, as required in the conventional "dual-mode" sorption model. Furthermore, fewer parameters are required than with the at least identical accuracy.